It is an amazing coincidence that there were two young women who came to Australia on the First Fleet and were named Elizabeth Cole. This was at first most confusing, but eventually we found proof of which one was ours and her whole story fitted together. We have been told that our Elizabeth Cole was baptised on 25 May 1762 in the Parish Church of the small Devon village of Lamerton, not far from the western edge of Dartmoor and her parents were Thomas and Elizabeth Cole. These bare facts tell us nothing of Elizabeth’s history. She was most probably illiterate and her family poor, perhaps her parents died when she was young, leaving her to fend for herself. Perhaps she was just a high-spirited young girl who rebelled against authority and the injustice of a society where there was no education or help for the poor – a society that gave so much to the fortunate few and so little to the rest of the people. Elizabeth was tried at the Devon Lent Assizes, held at Exeter on 20 March 1786 before Sir James Eyre and Sir Beaumont Hotham. House -breaking, guilty value 4s, to be transported beyond the seas for the term of seven years. Elizabeth Cole, together with 88 male and 19 other female convicts, sailed on the Charlotte, departing Portsmouth on 13 May 1787. Apparently, Elizabeth Cole was still unruly, for on the 11 August in Rio de Janeiro she and 5 others from the Charlotte were exchanged for 6 quieter women on the Friendship. Also, on board the Friendship was the marine William Ellis, who we believe came from the same district in Devon as Elizabeth Cole. At last on 19 January 1788 the Friendship and all other vessels of the fleet arrived at the shores of Botany Bay, which was an epic achievement of navigation, because not only did those 11 small ships arrive safely at their destination, they all arrived within a few hours. However, Botany Bay proved to be unsuitable for a settlement, as parts of the land was swampy and supply of fresh water was poor, and though the bay was extensive there was no shelter from the easterly winds and ships of moderate draught would always have to in an exposed situation. The fleet moved to Port Jackson, arriving there on 26 January 1788. The next we hear of Elizabeth, it is 10 August 1789 and we read of the christening of a child, Thomas Cole, the son of Elizabeth and Marine Private William Ellis, who Lieutenant Clark described as an honest man. In the meantime, when Captain Phillip was given his orders for establishing the new colony, he was told also to establish a small settlement on Norfolk Island, to prevent its occupation by any other European country. Elizabeth Cole with her young son Thomas, together with 96 men, 65 women and 25 other children were transported there on the Sirius arriving 13 March 1790 and proceeded to the place now known as Cascade, on the northern leeward side of the island. Elizabeth had another child named Maria, born on 27 December 1795, after marrying a James Tucker, but she left him and moved in with a Richard Burrows – James Tucker died on 4 December 1807. Richard Cornelius Burrows was born in Northamptonshire in about 1759, and on 14 July 1787 he was imprisoned in the county gaol awaiting trial for trail for stealing one ewe hoggrell (a year-old sheep). 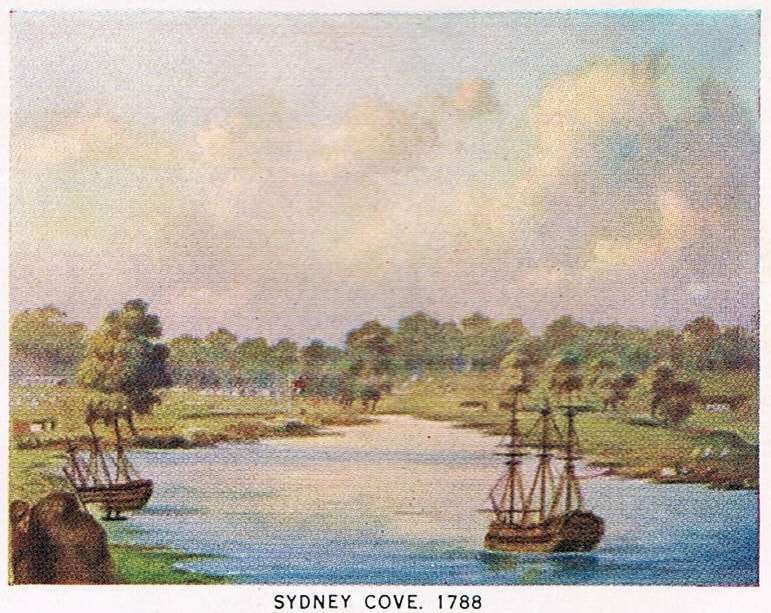 Richard was sentenced to be transported for the term of seven years and arrived in Sydney on 29 June 1790, as part of the Second Fleet on board the Scarborough, and in September 1791 Richard was transported to Norfolk Island. On 13 June 1798 another child was born to Elizabeth and this time it was the son of Richard Burrows, named after his father. By this time Elizabeth and Richard had now completed their sentences, whatever they had done in England was behind them and they could look forward to the future in a brand-new land. They remained together and two more children were born, Ann on 8 May1800 and John on 7 March 1803. In 1800 a Protestant clergyman, the reverend Henry Fulton arrived from Ireland to act as Chaplain on Norfolk. And so, it was that Elizabeth’s four younger children were baptised by Henry Fulton on 10 April 1803, Thomas had been baptised in Sydney. The details of the next part of the story are not clear, but somehow Richard Burrows acquired the land that had been granted to a William Syms, which was 60 acres of good land in the centre of the island. Anyone visiting today will find it quite easy to locate as it fronts the main road between Kingston and the town of Burnt Pine. In June 1803 Governor King received orders from England that because of the cost of maintaining the settlement on Norfolk some of the settlers would be moved from there to Van Diemen’s Land. On 3 September 1808 the Burrows family transferred to Hobart on the sailing ship City of Edinburgh and were married by the Reverend Robert Knopwood on 25 February 1810 after cohabiting together for fourteen years. On 20 September 1813 Richard Burrows received a grant of 40 acres of land at Glenorchy on the banks of the Derwent River. Richard drowned on 27 February 1818, when the boat he operated capsized in the Derwent River while ferrying 12 passengers. His body was picked up within a few yards of his house at Black Snake on 10 March. The Coroner’s inquest immediately convened to view the body. Verdict Drowned by Accident. He was buried the same day, and followed to the grave by his widow and four children and a number of Norfolk Island settlers. Elizabeth Cole Burrows died of natural causes on 31 January 1821. Both are registered at St David’s Hobart. The following is a brief excerpt from a book written by Lorraine Lister and submitted by her cousin Lance Summergreene. The book is titled And So they Came, and includes the families of Burrows, Stansalls, Griffiths, Staples and Tilley.